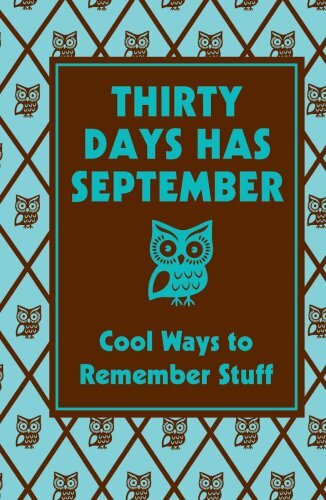 How I could I not mention this wonderful memory enhancing book on a day such as today, September, 30. I never pass up an opportunity to make life easier — with categories such as Excellent English; Hot on History; Geography Genius: Time, Weather, and Science; and magnificent Math; remembering everything is as easy as A…B…C…! WHAT: For the first time, readers and fans will have the opportunity to join a live online chat with authors, and friends, Terry Brooks and Christopher Paolini. The authors will discuss the worlds of fantasy, film, and literature and take questions from fans. In anticipation of the release of Return to the Hundred Acre Wood by David Benedictus, which goes on sale October 5th, I want to share this video of Jim Dale reading the exposition from Return to the Hundred Acre Wood during the recording of the audio book. Return to the Hundred Acre Wood is the first authorized sequel to A.A. Milne and E.H. Shepard’s classic books, Winnie-the-Pooh and The House at Pooh Corner to be written in over eighty years! According to G. Reid Lyon, former Chief of the Child Development and Behavior Branch of the National Institutes of Health, “If you do not learn to read and you live in America, you are not likely to make it in life.” As unsettling as this quote may be, it is all too often the outcome awaiting children with disabilities who cannot read. Reading supports all other academic skills. Without being able to read, children are not able to write or spell. Science, social studies, math, and technology will likewise prove elusive.